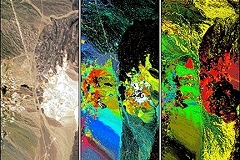 PRISMA, the Hyperspectral Precursor of the Application Mission, is an Earth Observation system with innovative, electro-optical instrumentation that combines an hyperspectral sensor with a medium-resolution panchromatic camera. to test the hyperspectral payload in orbit – the first or among the first at the European level. The PRISMA Mission (the launch should be planned for the end of 2013) is the follow-on of the Hypseo mission, whose phase B was completed in 2002, finalized so as to be precursor of and synergic with (specifically for the Pan/Hyp payload design and development and relevant part of the Ground Segment) the Italian-Canadian Joint Hyperspectral Mission (JHM), which is being developed in cooperation between the Agenzia Spaziale Italiana (ASI) and the Canadian Space Agency (CSA). Particularly Planetek Italia defines the architectural design for the Geolocation and Geocoding components for both hyperspectral and panchromatic products and develops SW. The geocoding sub-system takes in input PRISMA products of level 1 and produces geolocated and geocoded products of level 2.